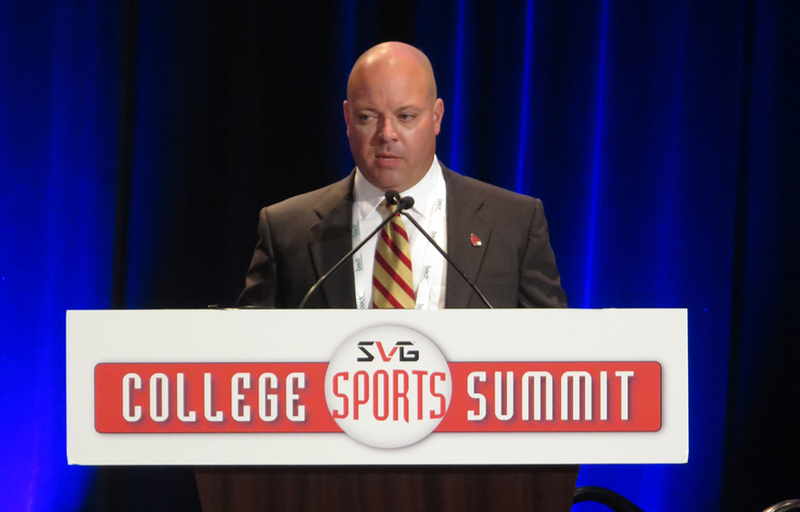 At the SVG College Sports Summit in Atlanta on Thursday, the SVG College Sports Summit Pioneer Award, which honors innovators in video production and technology at the university level who have advanced the industry at large, was presented to Chris Taylor, senior director, digital sports production, and lecturer, Ball State University. Taylor is in his seventh year as a lecturer in the Telecommunications Department and leads the school’s digital sports-production and immersion efforts. He founded Ball State Sports Link, the nation’s first fully immersive sports-production program, in 2009 following a successful pilot program that ran before his return to campus after a short hiatus. Sports Link has trained countless students who have gone on to work in the industry and has radically redefined the content-creation relationship between athletics and academics. In 2015, Taylor was promoted from instructor to lecturer at Ball State, while also moving to senior director of digital sports production. The academic concentration on digital sports production is the first of its kind by any college or university in the nation. Since 2009, Taylor’s students in Ball State Sports Link have garnered more than 75 state or national awards for sports production, including 18 Emmy nominations (11 wins) and 25 SVG Best of College Sports Media nominations (seven wins). His students have won 28 Indiana Association of School Broadcasters first-place awards and eight Broadcast Education Association Best in the Nation honors and two Best of Festival awards from all entry genres. Under Taylor’s direction, Ball State Sports Link students have received a wealth of opportunities off campus as well. He has developed an ongoing partnership with the NCAA, allowing students work with its digital team at the Final Four, and with Turner Sports, allowing Ball State students to take part in real-time social-media and digital operations at the 96th PGA Championship and the 2014 Ryder Cup. He also helped lead a team of Ball State students to the 2012 London Olympic Games, producing multimedia stories for national media outlets. Sports Link had the first student-produced programming to air on a national television network when it partnered with Fox College Sports in 2010.